Little Bird Told Me is a Yorkshire-based baby toy specialist that makes a super range of innovative yet traditional nursery toys. Included in their portfolio are activity play gyms, musical mobiles, rocking horses and rocking animals such as the stunning Curious Caterpillar Infant Rocker. Suitable for babies aged 9 months and over, Curious Caterpillar has a wonderfully expressive face and is made from a range of brilliantly tactile green, blue and red fabrics. There is so much for babies to explore on this safe and study rocker. A soft apple creates a comfortable and supportive seat, and a lift-up flap reveals a super place to keep your child's favourite teddy, rattle or other toys. Little hands will love exploring the chiming toy which peeks out of the apple. There's also plenty of other additions to keep your baby amused such as hidden squeaks, chimes and crinkles. 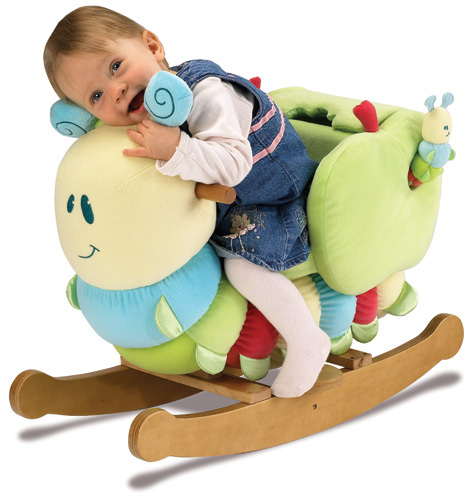 Please tell us what you think of the Curious Caterpillar Infant Rocker.